For forty years The ECG Made Easy has been regarded as the best introductory guide to the ECG, with sales of over half a million copies as well as being translated into a dozen languages. Hailed by the British Medical Journal as a "medical classic", it has been a favourite of generations of medical and health care staff who require clear, basic knowledge about the ECG. 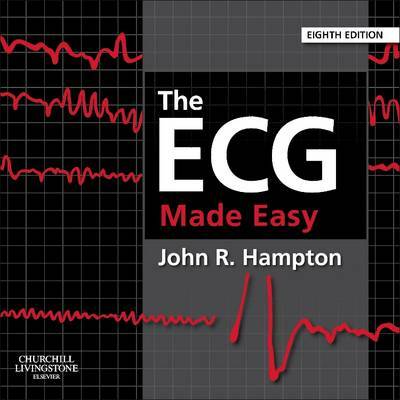 This famous book encourages the reader to accept that the ECG is easy to understand and that its use is just a natural extension of taking the patient's history and performing a physical examination. It directs users of the electrocardiogram to straightforward and accurate identification of normal and abnormal ECG patterns. A practical and highly informative guide to a difficult subject. Provides a full understanding of the ECG in the diagnosis and management of abnormal cardiac rhythms. Emphasises the role of the full 12 lead ECG with realistic reproduction of recordings. The unique page size allows presentation of all 12-lead ECGs across a single page for clarity. Restructured into two clear sections, the first 'The Basics' explains the ECG in the simplest possible terms. The new second section, 'Making the most of the ECG', has separate chapters on the ECG patterns that might be seen in healthy subjects and in patients presenting with chest pain, breathlessness, palpitations or syncope. "This pocket sized hero, the epitome of the medical classic, explains the 'three Rs' - rate, rhythm and right (or left) cardiac axis - in plain English and with elegant diagrams."